The Cocker Spaniel is the smallest member of the Sporting Group. He has a sturdy, compact body and a cleanly chiseled and refined head, with the over-all dog in complete balance and of ideal size. He stands well up at the shoulder on straight forelegs with a topline sloping slightly toward strong, muscular quarters. He is a dog capable of considerable speed, combined with great endurance. Above all he must be free and merry, sound, well balanced throughout, and in action show a keen inclination to work; equable in temperament with no suggestion of timidity. Solid colour black, to include black with tan points. The black should be jet; shadings of brown or liver in the sheen of the coat are not desirable. A small amount of white on the chest and /or throat is allowed, white in any other location shall disqualify. The colour shall be of a uniform shade but lighter colouring of the feather is permissible. A small amount of white on the chest and/or throat is allowed; white in any other location shall disqualify. Two or more definite, well-broken colours, one of which must be white,including those with tan points. The ideal height at the withers for an adult male is 15 inches (38 cm), and for an adult female 14 inches (35.5 cm). 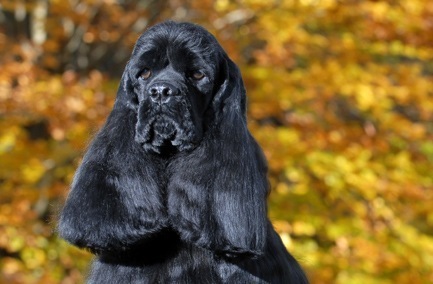 Unlike English Cocker Spaniels, these dogs have been bred for shorter, rounder heads and more “outward” eyes, resulting in several medical issues involving their ears and eyes. Epilepsy is reported in 4% of American Cockers. Behavioural problems are a bigger issue: careful evaluation is vital when choosing a puppy as there is a moderate degree of fearful-dominant temperaments in this breed.